A logarithmic scale is a nonlinear scale used for a large range of positive multiples of some quantity. Common uses include earthquake strength, sound loudness, light intensity, and pH of solutions. It is based on orders of magnitude, rather than a standard linear scale, so the value represented by each equidistant mark on the scale is the value at the previous mark multiplied by a constant. Some of our senses operate in a logarithmic fashion (Weber–Fechner law), which makes logarithmic scales for these input quantities especially appropriate. In particular our sense of hearing perceives equal ratios of frequencies as equal differences in pitch. In addition, studies of young children in an isolated tribe have shown logarithmic scales to be the most natural display of numbers in some cultures. It can also be used for geographical purposes like for measuring the speed of earthquakes. Various scales: lin–lin, lin–log, log–lin, and log–log. Plotted graphs are: y = 10 x (red), y = x (green), y = loge(x) (blue). The top left graph is linear in the X and Y axis, and the Y-axis ranges from 0 to 10. A base-10 log scale is used for the Y axis of the bottom left graph, and the Y axis ranges from 0.1 to 1,000. The top right graph uses a log-10 scale for just the X axis, and the bottom right graph uses a log-10 scale for both the X axis and the Y axis. may contain exponential laws or power laws, since these will show up as straight lines. A slide rule has logarithmic scales, and nomograms often employ logarithmic scales. The geometric mean of two numbers is midway between the numbers. Before the advent of computer graphics, logarithmic graph paper was a commonly used scientific tool. 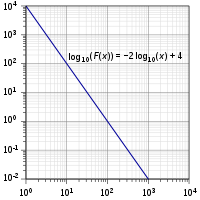 Plot on log–log scale of equation of a line. If both the vertical and horizontal axes of a plot are scaled logarithmically, the plot is referred to as a log–log plot. If only the ordinate or abscissa is scaled logarithmically, the plot is referred to as a semi-logarithmic plot. A logarithmic unit is a unit that can be used to express a quantity (physical or mathematical) on a logarithmic scale, that is, as being proportional to the value of a logarithm function applied to the ratio of the quantity and a reference quantity of the same type. The choice of unit generally indicates the type of quantity and the base of the logarithm. Examples of logarithmic units include units of data storage capacity (bit, byte), of information and information entropy (nat, shannon, ban), signal level (decibel, bel, neper). Logarithmic frequency quantities are used in electronics (decade, octave) and for music pitch intervals (octave, semitone, cent, etc.). Other logarithmic scale units include the Richter magnitude scale point. Thus, we can interpret Boltzmann's constant as being simply the expression (in terms of more standard physical units) of the abstract logarithmic unit [log e] that is needed to convert the dimensionless pure-number quantity ln W (which uses an arbitrary choice of base, namely e) to the more fundamental pure logarithmic quantity Log(W), which implies no particular choice of base, and thus no particular choice of physical unit for measuring entropy. ^ "Slide Rule Sense: Amazonian Indigenous Culture Demonstrates Universal Mapping Of Number Onto Space". ScienceDaily. 2008-05-30. Retrieved 2008-05-31. Dehaene, Stanislas; Izard, Véronique; Spelke, Elizabeth; Pica, Pierre (2008). "Log or linear? Distinct intuitions of the number scale in Western and Amazonian indigene cultures". Science. 320 (5880): 1217–20. Bibcode:2008Sci...320.1217D. doi:10.1126/science.1156540. PMC 2610411. PMID 18511690. Tuffentsammer, Karl; Schumacher, P. (1953). "Normzahlen – die einstellige Logarithmentafel des Ingenieurs" [Preferred numbers - the engineer's single-digit logarithm table]. Werkstattechnik und Maschinenbau (in German). 43 (4): 156. Wikimedia Commons has media related to Logarithmic scale. "GNU Emacs Calc Manual: Logarithmic Units". Gnu.org. Retrieved 2016-11-23.